Canadian Brand Rivalus has hit the Australian market by introducing their latest product Rival Whey. Rivalus brand is an experienced brand that was discovered by some of the original founders of well-known brand Optimum Nutrition. Rivalus understands the importance of macronutrients which is why 100% whey protein blend has been created to help you reach your goals faster. In this review, we’ll take a look at what this supplement has to offer. If you’re a serious trainer or bodybuilder then you should know the importance of ingredients in any supplement to get the results you want to achieve. Among all macronutrients, protein is the most significant to support optimal muscle growth, increase muscular endurance and improve physical performance. As one of the most valuable nutritional source for any trainer, Rival Whey combines a fast acting protein blend to allow protein to be absorbed as quickly as possible into the bloodstream. Rival Whey has an additional 5g of BCAAs which signal muscle protein synthesis and provide the fuel you need to recover from hard training. This makes it a great muscle building protein. Better yet, for those who are trying to get or stay lean Rivalus Rival Whey is a low fat, carb and is low in calories perfect to take post-workout. Although there aren't many negatives what can be commented is the texture of the shake when mixed with water. As the blend does not include any creamers, some may dislike the water texture of the product. However, if you do not like your shakes too thick Rival Whey is the way to go. 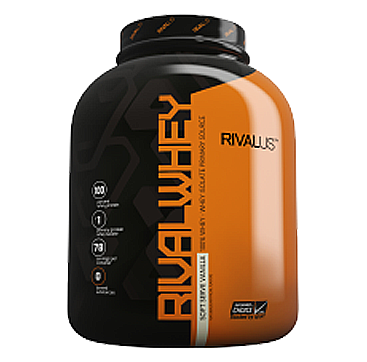 Rival Whey is available in three flavours including Chocolate, Vanilla and Chocolate Peanut Butter. Rival Whey is instanstised so it mixes well and easily with any liquid. We sampled the Chocolate flavour which was pleasant and easily drinkable but did lean on the watery end. Rival Whey is a great lean protein for all athletes and trainers out there that will significantly aid in muscle recovery. The superior protein is packed with fast acting proteins that delivers great tasting flavours perfect to add to your training stack!